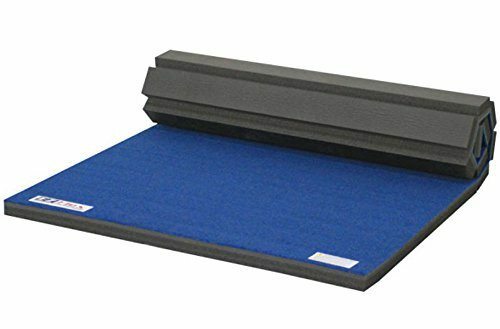 Cheer mats, also known as cheerleading mats, are portable and durable to provide a safe place for practicing routines or for cheering on the local sports teams. These mats come in a variety of sizes, colors, and styles, but all have been designed to offer a safe place for elaborate and often dangerous tricks to be practiced and performed. The cheerleading mats are also designed to roll up easily and become mobile so they can be taken to different events quickly and easily. 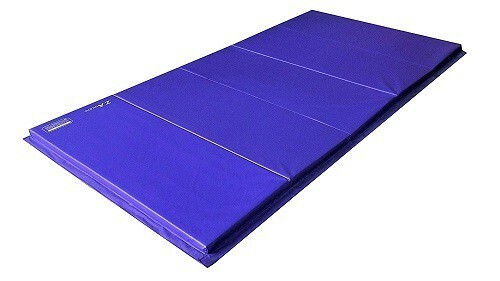 What are Cheer Tumbling Mats? The cheer mats are used for members of the cheer squad to hone their skills or to put on the performance of their lives. These cheer tumbling mats can be used at home, at school, or at sporting events, providing a safe platform where these team members are going to be jumping, flipping, and going airborne while in the middle of routines. The cheer mats are designed to not only absorb the impact while a member in practicing alone, they provide a safe environment while team members are trying to learn new complicated routines that require tossing another team member high into the air. While safety is always the top concern when it comes to the cheer mats, there are many other benefits to using these padded flooring pieces. Not only are they ideal for cheer squads to practice at home or at road events, they can be used for martial arts, gymnastics, exercise, and wrestling. 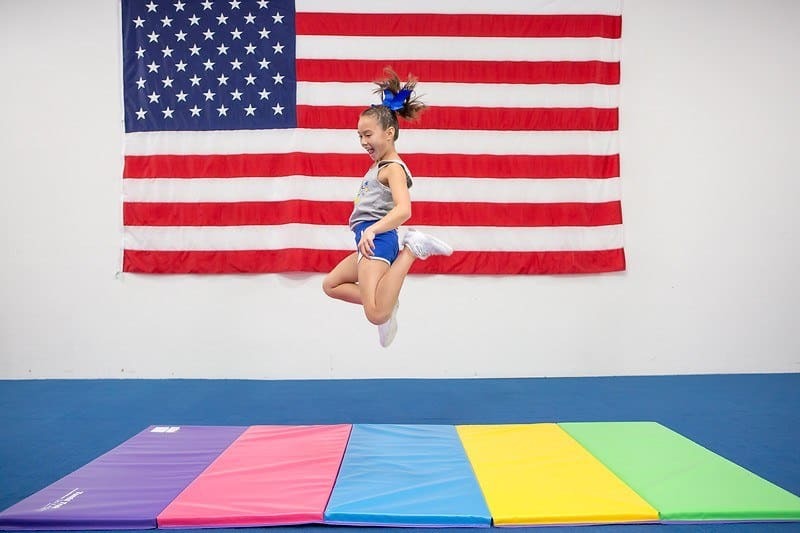 For the cheerleader, wrestler, or gymnast who wants to hone their skills at home, these cheerleading tumbling mats are ideal for use in the home or backyard. They provide a safe area to practice tumbles, jumps, flips, or complicated gymnastic moves. The size and weight of the cheap cheer mats allow them to be easily transported to a sporting event. When the squad has to root on the team on the road or the gymnastic team is putting on a charity event at the park, these tumbling mats take the show anywhere. Not only are the cheer mats versatile, but they are also designed to give a safe place to practice and put on the show of your life. 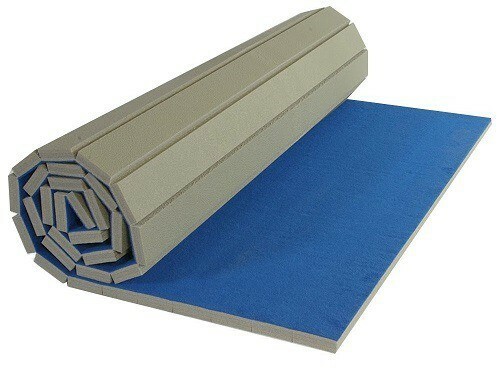 These can be used as excellent tumbling mats, gymnastic mats, and even are the best wrestling mats. The thickness of the mats are designed to absorb the impact of a fall so that injuries are held to a minimum. Nothing will discourage a child from reaching their potential like getting hurt and practicing in pain. These cheer mats help to reduce the chance of injuries and allow the child to gain confidence as they push themselves to new heights they didn’t even realize they could reach. 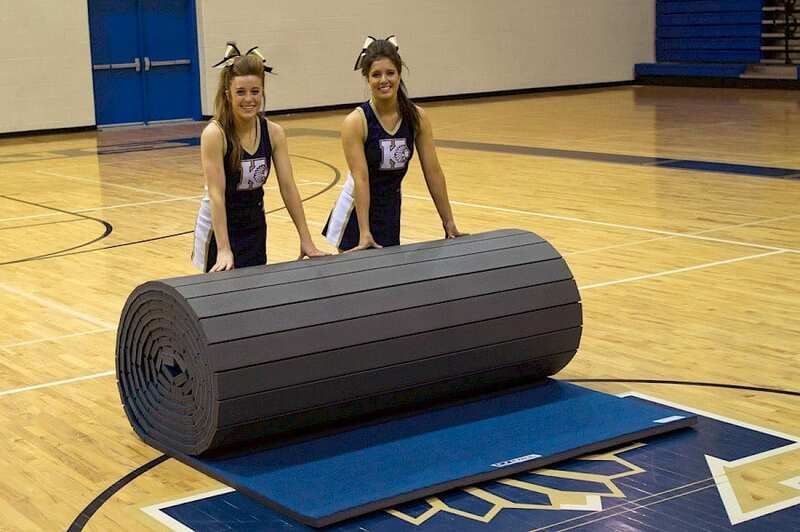 Whether using the cheer mat for home practice or taking the gymnastic mats to an event, they are a breeze to install. Depending on the size and quantity, the basic premise here is they unroll, and they are secured to the ground or each other with loops on the edges of the material. This is especially important when you are talking about cheer squads that are taking part in complicated routines that involve running and jumping all over the place. Once secure, the mats provide a safer environment, and can quickly be rolled up and transported to the next location. These excellent tumbling mats come in a variety of colors, sizes, styles, shapes, and prices too. The following list of five cheap cheer mats are affordable but do not compromise safety for cost. If the show has to be taken on the road, the mats can be rolled or folded for simple transport. These cheer mats come in a variety of fun colors and offer superior cushioning. Has looped connections on each side so they can be secured and attached to other cheerleading tumbling mats. Large size and durable materials perfect for wrestling, gymnastics, cheerleading, and even exercise. The perfect cheer mats or gymnastic mats for getting in some quality practice at home. Mats can easily be attached to one another, simple to transport, and breeze to unroll, and convenient to store away. 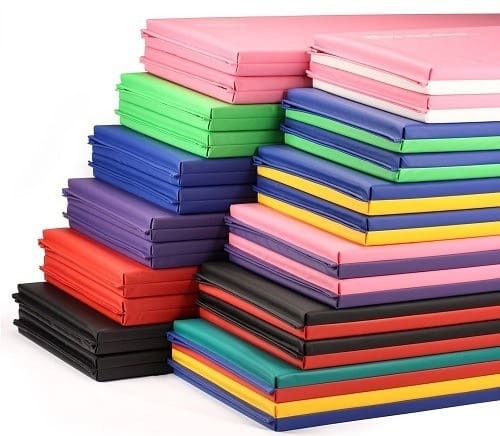 These cheer mats come in a large number of colors, and can be used for anything from exercise, gymnastics, cheerleading, martial arts, yoga, and tumbling. Utilizes the highest quality materials and outer coating is puncture resistant. Velcro sides allow for multiple mats to be joined to create large workout area or long tumbling runs. Perfect for practicing cheer routines at home and then rolling up and taking the cheer mat on the road. Durable material is ideal for gymnastics, cheerleading, and martial arts practice. Perfect to take on those travel cheer and gymnastics events. 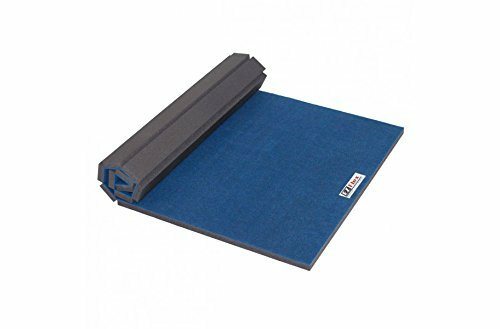 This is the deluxe version of the cheap cheer mats but provides superior protection whether practicing complicated cheer drills, wrestling moves, or exercise routines. 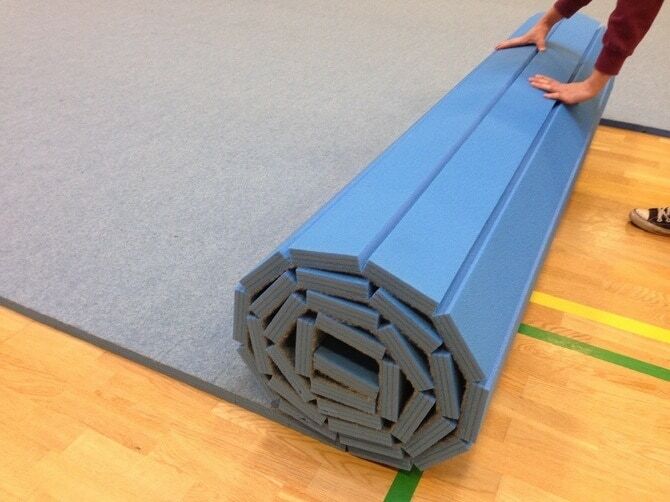 Two mats attached can create on a long strip for tumbling routines or a large square practice area.